The USA has baseball and Canada has ice hockey. But what is the national sport of Japan? Sumo wrestling! 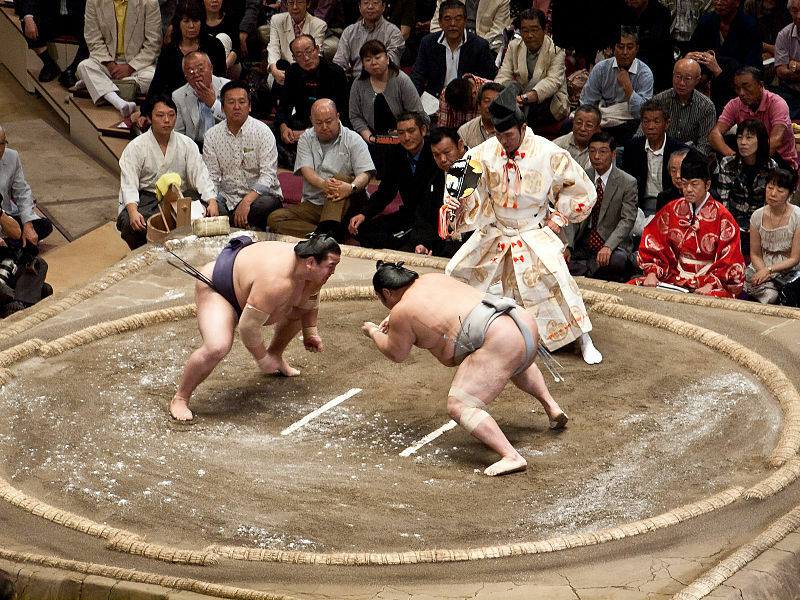 Japan is the only country where sumo fights are held professionally. The sport dates back to ancient times and to this day has preserved many of the Shinto rituals and traditions from which it first arose. A sport unlike any other martial arts or wrestling event on the globe, sumo wrestling is a must-see for travelers to Japan. Though recognized by the IOC, sumo wrestling will not be an official part of the 2020 Summer Games in Tokyo. But that doesn’t mean travelers to Tokyo for the games shouldn’t make it a point to witness a sumo fight during their time in Japan. Sumo is a wonderful chance to learn about Japanese culture and develop an appreciation for a completely different kind of athleticism. Sumo wrestling is a full-contact wrestling sport. Two wrestlers, or rikishi, compete to either force their competitor out of the ring or to cause him to fall. 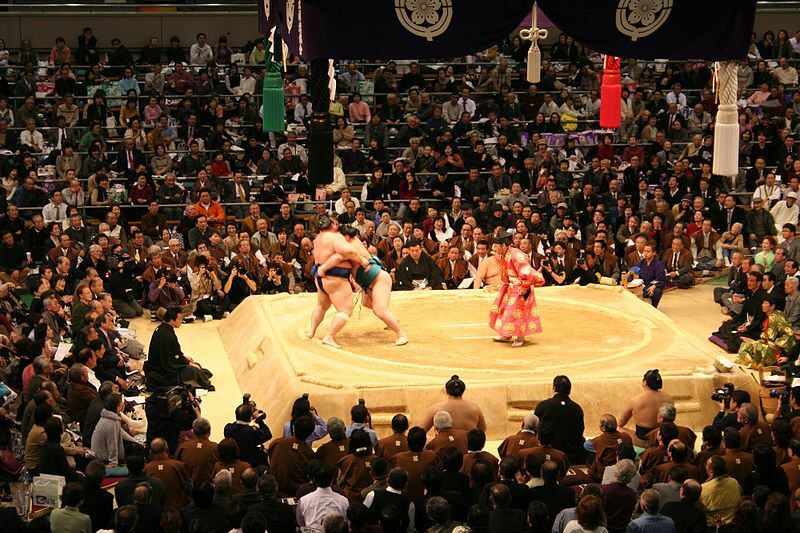 The ring, or dohyo, is made of clay with a layer of sand on top and is approximately 15 feet in diameter. Sumo wrestling matches usually last only a few seconds each, but in rare cases, it can take over a minute before a rikishi is pushed out of the dohyo or falls. 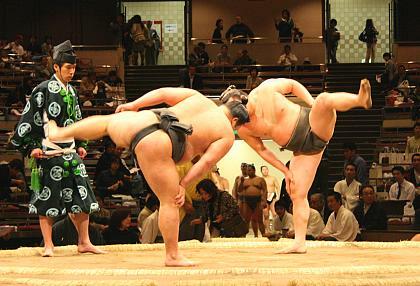 Unlike most martial art sports, sumo does not have any weight divisions, so sometimes wrestlers may face off against an opponent significantly larger than themselves. Japan’s champion sumo wrestler carries the title yokozuna. What are some sumo wrestling traditions? Before the match begins, the two rikishi perform something of a ritual dance. First they slap their hands together to attract the gods’ attention. This is a Shinto ritual that you may observe elsewhere in Japan – many devout worshipers do this when they entire a shrine. Next, the rikishi turn their hands up to the heavens, thereby proving that they don’t have any weapons. 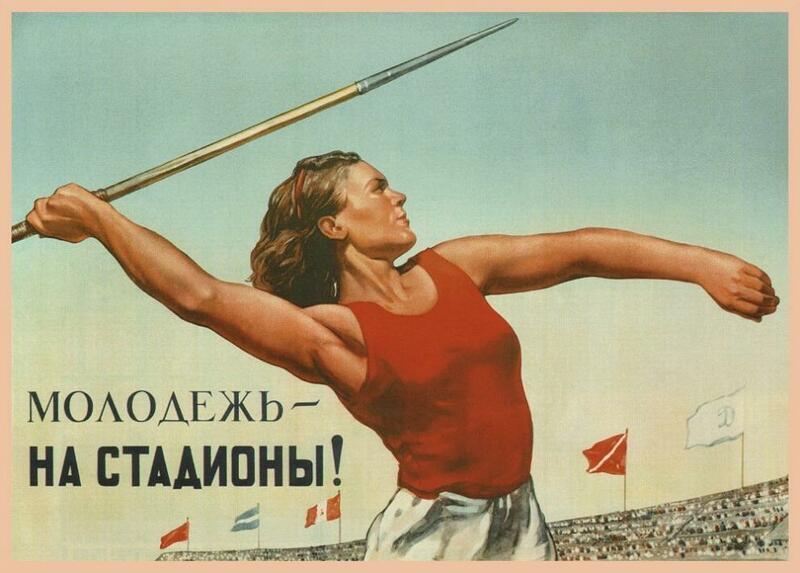 Finally, the wrestlers will squat, raise their legs, and stamp the ground repeatedly. This is meant to scare bad spirits away that may be hiding in the dohyo. Rikishi also throw salt into the dohyo before each match to purify the ring and protect against injury. They may do this in combination with the pre-bout dance for up to four minutes before beginning the fight. While this can seem like a lot of build up for a fight that generally only lasts a few seconds, these rituals are hugely important for the rikishi. Not only is the ritual an opportunity to enter the right mindset before the match, it is also a chance to size up and potentially intimidate your opponent. While mawashi may look silly to westerners, like over-sized thongs or diapers, they are a sacred and practical piece of equipment for sumo wrestlers. Mawashi are the official sumo wrestling outfit, and are less like loincloths than they are like belts. Mawashi are made from a 30′ x 2′, 10-pound piece of silk that needs to be expertly folded to fit the athlete. The wrestler may also attach stiffened silk fronds to the mawashi, marking the parts that are illegal for their opponent to grab. For many wrestlers, there is a great deal of superstition tied to their outfits, and they will change the color of their mawashi to influence luck. There is strategy to how tightly the mawashi is tied. A rikishi whose technique revolves around lots of contact will generally wrap it tightly and splash it with water so his opponent can’t grip it. Wrapping the mawashi more loosely, on the other hand, protects the wrestler from being thrown. What are the sumo wrestling rules? There are several things that are strictly forbidden in sumo wrestling: no striking with closed hands, no choking, no kicking the chest or waist, no hair-pulling, no jabbing the eyes or the solar plexus, no double ear slaps, no bending your opponents fingers and no grabbing your opponent’s mawashi in the groin region. Breaking any of these rules is grounds for immediate disqualification. Otherwise, the rules of sumo are very strictly observed: step one toe out of the dohyo and you lose; touch the floor of the dohyo with any part of your body that is not the sole of your feet and you lose. A gyoji, the sumo equivalent of a referee, stands nearby at all times to ensure that all rules are followed and to determine the winner. 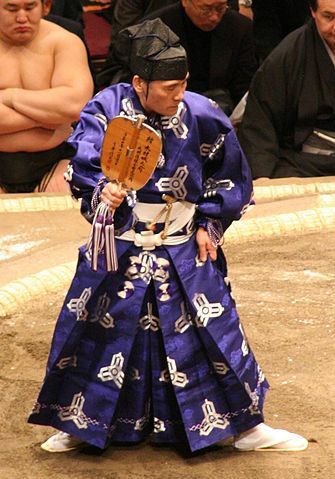 The official gyoji uniform is an elaborate silk outfit that includes a special hat and several props. How do sumo wrestlers train? Sumo wrestlers’ lives are strictly regimented according to the prescriptions of the Sumo Association. More than daily training and diets, sumo wrestlers need to grow their hair long to form a topknot and are forbidden from driving their own cars. They also need to wear the traditional silk outfit, the chonmage, while in public, which makes them immediately identifiable. Sumo wrestlers live in a communal training stable known as a heya. Within the heya, the wrestlers’ lives revolve around tradition. When they rise, eat, train, and sleep is all dictated by doctrine. Lower level wrestlers may have to do chores like cleaning and cooking, or even preparing baths for the senior wrestlers. Rikishi train intensely every morning, doing a variety of strenuous stretching, strength, and combat exercises. While the wrestlers may not look muscular or flexible, they are actually incredible athletes. Their bodies need to be prepared to dish out and endure forceful collisions. Learning to maneuver their heavy bodies takes a lot of practice and skill. Wrestlers do not eat breakfast. Rather they have a very large lunch with a lot of meat, fish, rice, and vegetables and along with beer to wash it down. After this lunch, the wrestlers are required to take a nap. This regimen is meant to help the wrestlers put on weight. 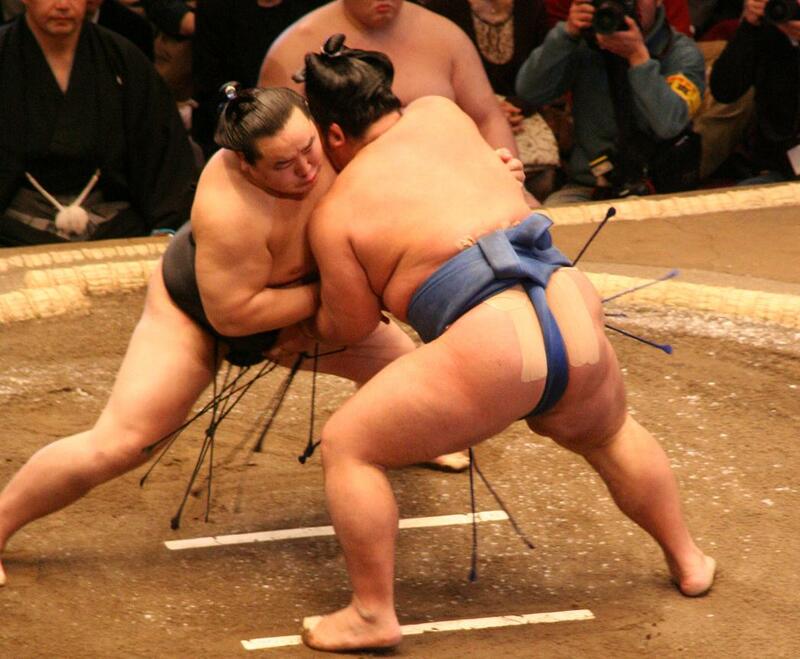 Where can I see sumo wrestling in Tokyo? 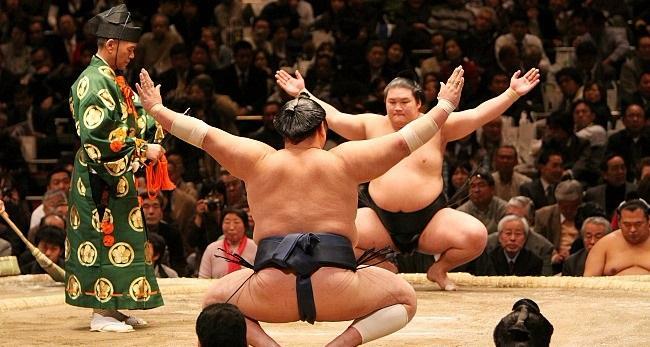 Three professional sumo tournaments take place in Tokyo each year. One during January, one during May, and one during September. Each tournament begins on a Sunday lasts for 15 days and gives you the opportunity to see hundreds of bouts. 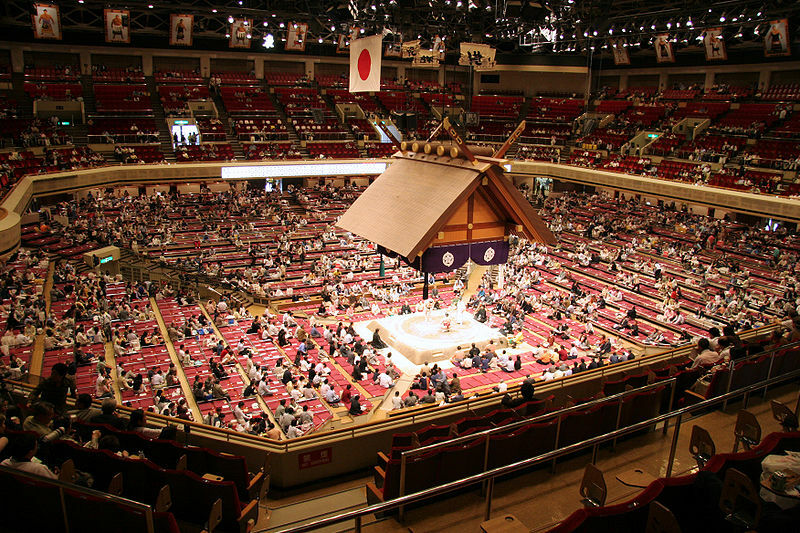 The venue is the Ryogoku Kokugikan, also known as the Ryogoku Sumo Hall. Originally built in 1909, this gigantic stadium can accommodate over 11,000 spectators. This is the same venue that will host the Boxing events for the 2020 Summer Games. Since sumo is not an official part of the Summer Games and Tokyo’s main sumo venue will be in use during that time, there won’t be any professional sumo to see in Tokyo during the 2020 Games. However, this should not stop visitors from seeing sumo wrestling in person. Every July there is a professional sumo tournament in Nagoya, about 160 miles southeast of Tokyo. Tickets to the bouts cost anywhere between 4,800 to 13,400 Yen ($34 – 120 USD) depending on the seating you choose. They can be booked online, via phone, or by lining up the day of. Another option for watching sumo wrestling during your time in Tokyo is to visit a sumo stable. There are over 45 beya in Tokyo and many of which allow travelers to visit the stable and observe the practice. Some stables, like Arashio, can be visited without a reservation, but don’t permit you to enter the building and instead ask that you watch from an outside observation deck. Other beya like Musashigawa, Kasugano, and Takasago permit tours inside of the studio so long as guests have a guide who is fluent in Japanese. 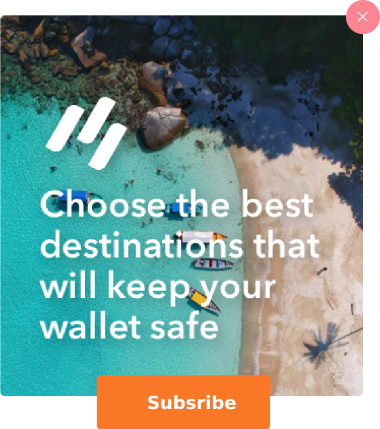 The reasoning behind this is that there are many rules and customs that need to be respected, and they don’t want anything to be lost in translation. Furthermore, there is also the Tokyo Sumo Museum. With free entry and a huge collection of sumo artifacts, this museum is a great place for interested visitors to spend the day. Ready to see the world’s most incredible athletes compete for the gold? 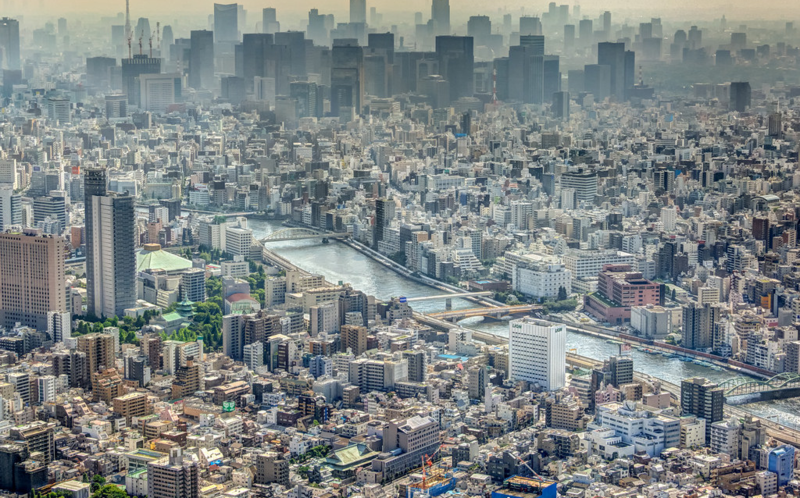 Travel with Bucket List Events to the 2020 Summer Games in Tokyo, Japan for a seamless experience complete with hotels, transportation, city tours, and special events.